This no compromise fan also gives you full customisation of both performance and appearance. Note: ML fans require a constant 12V in order to lift the bearing for it to spin. Sound Level: 37 dBA. Fan Airflow: 97 CFM. P/N A1425L12S. Fan Speed 1400 R.P.M. Noise 28.1 dB-A. Connector 3 PIN. Life Expectation 40,000 hrs,25℃. Bearing Type Hydraulic Bearing. We do not compromise on quality. of service. Maximum Fan Speed - 1200RPM /- 10%. Fan screws not included. Connector - 3 Pin. We do not compromise on quality. of service. Noise Level: 18dBA. Product Overview. CFM: 32.95. ARCTIC F14. Colour of product: Black, Blue, White. Rated current: 0.12 A, Maximum current: 0.25 A. Width: 14 cm, Depth: 2.7 cm, Height: 14 cm. This does not affect your statutory rights. We exclude any liability for any errors and omissions on the site. Has been pulled from a working computer and is in excellent condition. Static Pressure. Speed Sensor. Input Power. >150,000 h. Acoustical Noise. Size: 140mm×140mm×25mm. All product images are taken in kind, the lighting, computer monitor differences result in a bit difference with the actual products. Cable Length: 30cm. Life: 35000 hours. Air flow:89.3CFM. Model: ML140 Pro LED White. Corsair ML Series Fan. The fan is in very good condition and has only been in-use within a well-cooled desktop PC for just under a year. The item fully works without issues and has been professionally cleaned to ensure the most efficient operation. You could use the fan as an exhaust fan for your rig, or as an intake fan for side panels or the bottom of your case. Our black PC case fan has been designed so that a vast amount of air can be quietly moved around your case. Model: RAIDMAX 140mm. Fan Screws Not Included. Bearing : Sleeve. We do not compromise on quality. of service. our hands. Current: 0.03A. On four corners the rubber material incorporated silencer blocks design not only eliminating the vibration caused by rotating fan blades but also efficiently absorb noise induced by moving air. Bearing System: FDB (Fluid Dynamic Bearing). Our German engineers made this fan work at lower speed when performance is not needed. Perfect Case Fan Regulation with PWM. The PWM function allows the motherboard to run the fan precisely at its necessary speed. COOLERMASTER 140MM 3 PIN A14025-12CB-3BN OEM. The better airflow inside your system, the cooler and more stable system you will get. Coolermaster is well known for it's quality and range. This model is great for all types of cooling systems. BRAND NEW AND SEALED Corsair ML Series ML140 Pro Magnetic Levitation Fan (140mm) with Blue LED. Dispatched with Royal Mail 2nd Class. Phanteks PH-F140SP 140 x 140 19 dB(A) . Good case or radiator fan Excellent condition Condition is Used. I've 2 for sale and the wont fit in my new case. Power connector 3-pin fan connector and 4-pin Molex connection. You could use the fan as an exhaust fan for your rig, or as an intake fan for side panels or the bottom of your case. Our black PC case fan has been designed so that a vast amount of air can be quietly moved around your case. BitFenix Spectre PRO PWM 140mm Case Fan BFF-SPRO-P14025WW-RP - Black. Dispatched with Royal Mail 2nd Class. 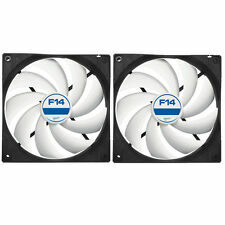 SilverStone SST-FHP141 v 2.0 - FHP Series Fan. High pressure/high airflow with dual ball long life bearing. Dual modes for quiet (500-1200RPM) or high performance (500-2000RPM) operartion. Good condition and full working order. NEW! Noctua NF-P14s REDUX 1200RPM 140mm Quiet Case Fan. Dispatched with Royal Mail 1st Class. Corsair Hydro Series H115i 140mm Cooler fan. Was previously being used as a rear exhaust case fan which served the purpose pretty well. Condition is Used but in full working order. 2000rpm 12V with 4 pin connector. Dispatched with Royal Mail 2nd Class. Riing 14 LED Green. ThermalTake has released the new Riing 14 LED Series, a 140mm fan fitted to enhance static pressure that produces impressive cooling performance with an optimized fan blade. In addition, an anti-vibration mounting system strengthens the stability during operation. 3x Fractal Design Silent Series R2 140MM fans. 1x Fractal Design Silent Series R3 140MM fan. Corsair Air Series SP140 LED Purple High Static Pressure 140mm Fan. Corsair Air Series LED high static pressure PC case fans combine efficient high pressure airflow with striking LED lighting. The custom-molded blades are translucent and have a frosted texture, so the light from the four LEDs adds a dramatic effect. Silent Wings 3 (1000 RPM, PWM, 140mm) PC Case/ Radiator/ Heatsink fan with an inaudible 1000rpm 15 decibel (at max speed) fluid bearing 6 pole motor. Tested working. 4 Fan Screws. 4 Hard Plastic Mounting Corners. Fractal Design Dynamic GP-14 PC Case Cooling Fan. Fractal Design Dynamic GP-14 computer cooling fan, had a few months of usage and generally good fans, however they do suffer from a well known issue where the bearing makes a slight ticking sound so are not dead silent but still quieter than alot of fans out there. Condition is Used. Like new very good condition. 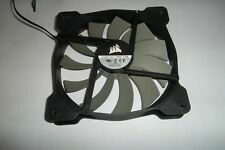 Pure Wings 2 (140mm) 4-Pin Case Fan. Arctic F14 (140mm) Case Fan - Low Noise. Phanteks PH-F140XP_BK Phanteks PH-F140XP PWM 140mm Fan - Black / White. More fromBe Quiet. Akasa 14cm Apache Black Fan. Akasa 14cm Viper Fan. Very Good Used Condition, Sanyo Denki 24V DC Fan. Manufacturer: Sanyo Denki. Product Category: DC Fans. Product: DC Fans. Product Type: Fans. Subcategory: Fans, Blowers & Accessories. Current Type: DC. Corsair Air Series LED high airflow PC case fans combine efficient, low-noise airflow with striking LED lighting. They’re translucent, with a frosted texture, so the light from the four LEDs adds a dramatic effect. Fan Speed: 1,350 RPM (@ 12V DC). Cable Length: 400 mm. Long Service Life. Noise: 0.3 Sone (@ 1,350 RPM). Air Flow: 74 CFM / 126 m³/h (@ 1,300 RPM). 2 x Corsair ML140 PRO LED Fans in excellent condition. Both fans tested and working well. At low fan speed, the motor noise is key. A motor developed in Germany with a new alloy/lubricant combination reduced friction and noise. Long Service Life. You could use the fan as an exhaust fan for your rig, or as an intake fan for side panels or the bottom of your case. PC case fan has been designed so that a vast amount of air can be quietly moved around your case. They have been tested and working fine. They are rated 1200rpm & are three pin. You could use the fan as an exhaust fan for your rig, or as an intake fan for side panels or the bottom of your case. 3-pin fan connector and 4-pin Molex connection. 140mm x 140mm x 25mm (W x H x D). 140mm Arctic F14 PWM, 9 Blade, Static Pressure Fan, 1350rpm, 74CFM, Fluid Dynamic Bearing, Black/White, 4-pin. 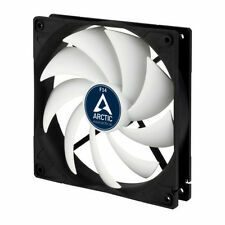 The ARCTIC F14 PWM fan is well known for high airflow at a comfortable noise level. Our German engineers made this fan work at lower speed when performance is not needed. Gelid Solutions Silent 14 Pro PWM, 140mm Quiet Case Fan. Therefore it fits most PC cases and CPU coolers on the market. Silent 14 Pro PWM. Air Flow (CFM). High Airflow and High Static Pressure. Quiet Operation runner mounts. Size: 140mm×140mm×25mm. Bearing Type: Sleeve. Life: 35000 hours. Rated Current: 0.16Amp. Air flow:89.3CFM. Size: 140mm×140mm×25mm. All product images are taken in kind, the lighting, computer monitor differences result in a bit difference with the actual products. Life: 35000 hours. Air flow:89.3CFM.